Susan Mullally is a Senior Archive Scientist for the MAST at STScI. She is an astronomer who likes working with time series data and improving the reliability of exoplanet catalogs. The Mikulski Archive for Space Telescopes (MAST) at STScI introduces a new way to explore the archive’s exoplanet data: exo.MAST. For confirmed planets and planet candidates, the web interface brings together planetary parameters with a filterable list of the data products held by MAST and visualizations of those data. The user starts with a single search bar that autocompletes to the confirmed exoplanet, Kepler Object of Interest, or TESS threshold crossing event (TCE) as the user types. The result is a targeted cone search of MAST data at the coordinates of the planet’s host star at the bottom of the screen. Star, planet, and orbital properties are shown at the top-left and various data visualizations are shown on the top-right. For confirmed planets, users can choose to see this catalog data from either the exoplanets.org or the NASA exoplanet archive. On the right, there are choices of several visualizations of the data. By default you are shown the data coverage of the MAST-held observations phase folded at the orbital period of the planet, if known. Selecting observations on this plot will filter the MAST holdings in the bottom panel. MAST is the archive for Kepler, K2, and the latest planet hunting mission, the Transiting Exoplanet Survey Satellite (TESS). For all transit signals found by the TESS or Kepler pipeline, the mission provides the detrended light curve and a fit to the transit signal. Exo.MAST takes these data and gives scalable and zoomable plots of the most recent detrended light curve and transit model. These plots can also be obtained via API so that they can be embedded into your web page. For example, here is the folded light curve for WASP-18 b, a Jupiter-sized planet observed by TESS. From the related links tab, there is a link to ADS with a pre-populated search of the literature for the planet and the host star to help the users dig deeper into the scientific literature. 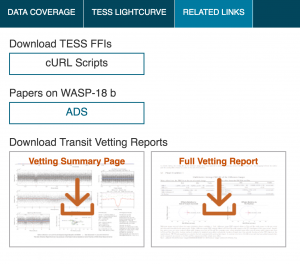 For TESS and Kepler exoplanets, this tab will also link to the reports used by those missions to review the transit signal before deciding if it’s a candidate or confirmed planet. 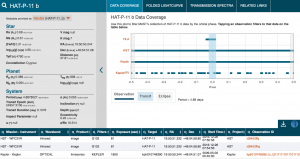 For exoplanets that have atmospheric characterization measurements, exo.MAST gives you access to the Space Telescope Archive of Transiting Exoplanet Spectra (STATES), which is a database of published transmission and emission spectra started by Dr. Hannah Wakeford. The data are plotted and are available for direct download. The STATES measurements are linked to the source paper and to the observations hosted within the archive so users can directly download and analyze the data themselves. In the near future, MAST will be hosting the exoplanet characterization data taken by the James Webb Space Telescope (JWST). exo.MAST plans to integrate tools from the exoplanet characterization toolkit (exoCTK) to help users plan their exoplanet observations with JWST more easily. Have questions or features you would like to see? What data visualizations would be most valuable to you? Comment below or e-mail us at archive@stsci.edu.